Palm Desert Landscaping Service will have your home or business looking like a vacation resort! If you're looking at a few landscape contractors, have a desert landscape concept in mind, or you're just interested in regular maintenance like pool cleaning, lawn care, and gardening services, then you've come to the right place. ​ Landscaping Palm Desert​ is such a challenge, but you'll be glad to know we're highly competitive, innovative, reliable, and above all... You'll be amazed at the quality of our work! We're among the best landscapers in Coachella Valley. Whether you're searching for residential landscaping in Indio CA or in need of Commercial Landscaping in Palm Springs, we serve the entire Coachella Valley Landscaping needs! ​ We're all trying to do our best to conserve water in the Coachella Valley. If you're tired of having to remember to turn your sprinkler on and off at the right time, let us install a timed sprinkler system for your lawn. Coachella Valley Landscaping Companies cover the entire Coachella Valley. We're centrally located in the valley, and will be happy to help you in: Palm Springs - Indio - La Quinta - Rancho Mirage - Palm Desert - Bermuda Dunes - Indian Wells - Thousand Palms - Cathedral City. Palm Desert Landscaping Service is rapidly expanding, and we understand there is a large selection of landscape companies in Coachella Valley. We appreciate your business, and we'll always provide you exceptional service and quality at a competitive cost. You're gonna love the new look of your landscaping project. We guarantee it! Indigenous landscaping saves you lots of time and money. Palm Desert Landscaping Professionals know how to organize your landscape using native plants, and they're very easy to maintain. Palm Desert landscape designs that use Indigenous plants, have adapted to their environment over thousands of years. These landscape designs require little to no pesticides, routine maintenance, and handle the harsh heat of our valley summertime. When having an Indigenous landscape installation put in, make sure the soil in the area has not been previously contaminated. Plants that are native to Coachella Valley will survive much better in areas that have not been previously disturbed (prior building contamination or trash etc. can raise the ph level of the ground). The increase in buildings and fences may cut back on the light some of our native plants need. This will determine a lot of the placement of our plants during the design phase. Some of the advantages to landscaping in Palm Desert are: Less demand for water, more available water for using elsewhere, landscaping survives intermittent Coachella Valley water restrictions, keeps the desert dust down and helps to control erosion. Palm Desert Landscaping Service has the expertise to properly install or repair your home or business fencing system. If you're looking to have fence repairs made, or a completely new fence installed, we have a wide range of fence options for your property: Chain Link (Galvanized or Vinyl Coated), Security, Privacy, Vinyl maintenance free, Bamboo Wood, Ornamental Wrought Iron, Stainless or Aluminum, and Commercial/Industrial Grade fencing systems with gates. For Faster Service, Please call. 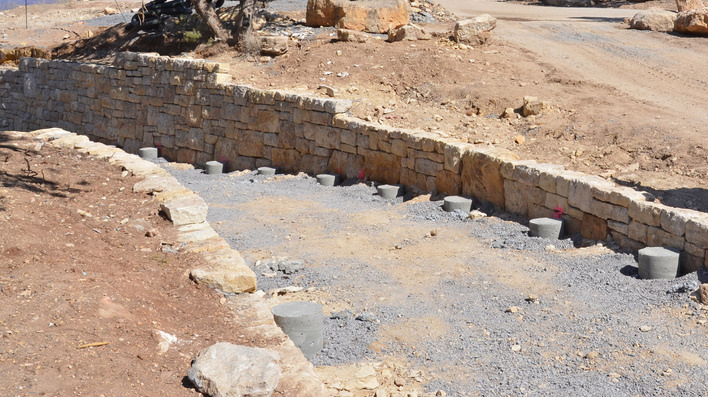 Looking to have a retaining wall put in? We have the experience and knowledge to redirect the rainwater (and melting snow from the mountains) to prevent your driveway, property or home from becoming part of a mudslide. Every year, California residents are faced with the looming threat of flood waters destroying their property. Let us help you minimize that risk by having one of our trained landscaping professionals install the proper drainage system in your new retaining wall. ​ Palm Desert Landscaping Service is a home grown company, and we strive to make sure our clients are satisfied with our work. We're not like those other companies that promise the world, and eventually fall through in the end. 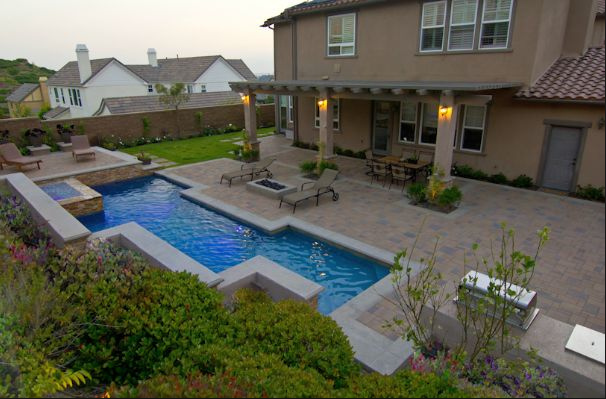 We are the most trusted company in the valley when it comes to the quality of your landscape, and your pool maintenance is the first thing people notice when they step outside. We know you're busy. You don't need to be wide awake the night before a big event, worrying about adding chemicals to your pool in order to get that nasty green growth off the pool walls and floor. We'll give you regular reports regarding the status of your pool's filtration system, pump and re-circulation line running from your pool. You'll never be hit with a surprise when your equipment is beginning to fail. That's where we're different from our pool cleaning competitors. Coachella valley Commercial landscaping suggestions. The key to a great commercial landscape is a mixture of function, form and design. For the landscape to grab attention of people you do business with, it must enhance the overall look of your property, and project the image of the market your organization serves. For example: If your business serves soothing, relaxation, and comfort, it will be better served to have water fountains, seating space, native grasses and palm trees. If your goal is get people in and out while looking elegant, be sure to not have seating areas or outdoor lounges. By creating a path along walkways with trees and bushes, you help to direct the flow of traffic. The same can be achieved by placing solar lights and accent hardscaping or stone edging. It is ideal to have some form of well kept landscaping to attract potential clients. Keeping it clean creates an exciting entrance and creates inviting curb appeal while maintaining that familiar friendly feeling. Leaving it over grown and unkept, sends a message that your company may not handle their clients at a high level they expect. It’s often times a good idea to keep the flow of landscaping from outside, looking the same inside. We don’t recommend a garden inside, but a few of the same plants from outside in neutral pots inside, keeps the theme and excitement after stepping foot inside. This also creates a feeling of framiliarity. 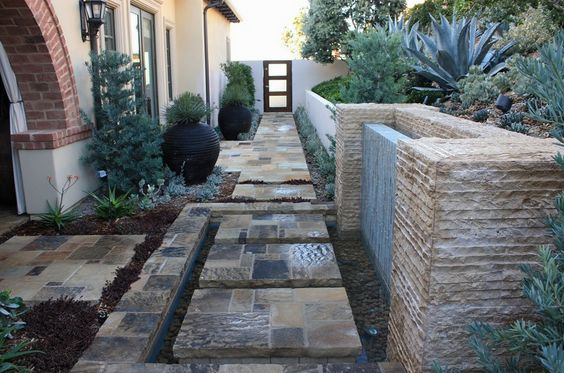 Palm Desert Landscaping Service, when possible, recommends indigenous landscaping plants to help conserve water, reduce maintenance costs, and it keeps a growth pattern that is easily maintained. Safety is a big concern when having a pool. It's important to make sure unsuspecting neighbors, relatives, and friends do not accidentally fall in. We have a bunch of pool fence options that are elegant yet effective against unnecessary accidents. For some of the more creative landscaping Palm Desert has to offer, be sure to check out The Living Desert gardens! #1 - Be sure to purchase enough plants. You don't want to run out of plants, and find out there isn't any more left that matches your landscape. #2 - Use a tarp. Tarps will hold your soil while you're digging holes, and it keeps your lawn clean from debris. It can also help transport weeds, brush, and debris to another location. #3 - Landscaping can require weed fabric. Weed fabric is best used under gravel or mulch landscape area. Using this barrier under planted areas of a flower garden (for example) will only create a short lived feeling of accomplishment, as the weeds will just start growing on top. If you choose to use this in the garden areas, make sure to cut small holes where the plant can grow through the fabric, and apply wood chip mulch over the weed fabric. #4 - If you plan on planting anything, use starter fertilizer. You always want your plants to have a huge boost when they're newly planted. Most of these products will have elevated phosphorous content and low nitrogen content. #5 - Know how much soil you will need. Soil is purchased by the cubic foot, so use the number of cubic feet multiplied by 4 will give you square footage of coverage at a 3" depth. Pick from buying in bulk or bagged based on your location (if you need to move soil to a hard to reach spot). Bagged may cost more, but may be convenient. Again, using a tarp to hold bulk soil is recommended over grass upon delivery. #6 - Buying your garden tools is important. Buy quality tools. You may think you're never going to need the tools again, but nothing is worse than trying to use a broken tool. #7 - Keep all of your Annuals in pots or beds at high visibility locations. This creates a big impact for the color exposure in the long-bloomers. #8 - If you group all of your shrubs and plants into a landscaped area, it will make it much easier to mow the lawn (avoiding having to mow around all the shrubs and trees separately). #9 - Consider re-using the grass clippings. Grass clippings will cut back on the need for fertilizers. We recommend mulching instead of bagging and disposal. #10 - Test your soil. It's a good idea to know what fertility requirements your lawn needs. No sense in wasting money on the wrong fertilizer on your lawn. #11 - It's good to sketch out a plan for your home or business landscape, prior to starting. This will allow you to see the big picture, keep your budget balanced, and focus on one phase at a time. #12 - Creating a natural looking edge around beds gives it a a particular look, and allows for easier landscape maintenance over the long term. Leaving your landscape more natural instead of using store bought edging allows for a bit more flexibility. Palm Desert Landscape is quite a sight. We have a bunch of options to spruce up your back yard with beautiful flowering bushes and shrubs. Have you heard of Knife-Leaf Acacia, Chuparosa or the Hummingbird magnet Emu Bush? Check our flowering desert shrubs! Palm Desert Landscaping Service has over 20 years of experience installing custom California patio pavers and walkways. Quite often people want a different look from the normal boring concrete sidewalks and patios. Not sure what you want to put in? Not to worry because we have the options that match your taste and style. We have tons of bricks and blocks in all shapes, colors, and sizes to pick from. We'll even remove your existing pavers, check the base for quality issues, fix, and reinstall a new patio paver system with beautiful pavers that you'll enjoy for many many years to come. Need to shore up your property from sliding into your pool? We'll be there to assist with a number of different options to keep your property in it's place! Retaining walls are Amazing! Looking to have a few different ideas besides the normal stone and desert sand for the sides or back of your home? We have lots of different types of paver stone and concrete options! Would you like to become the envy of your family, neighbors, and friends this year? 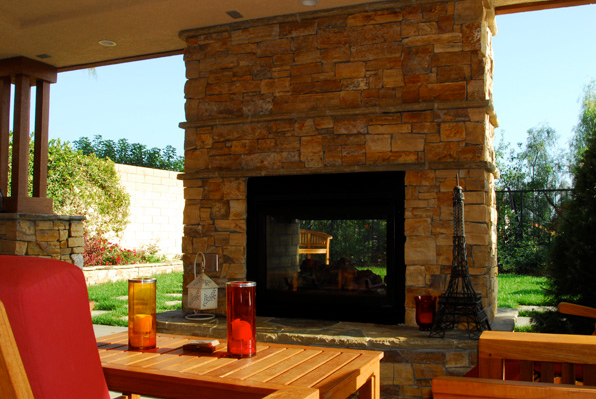 An impressive outdoor fireplace or kitchen ensemble will be sure provide the most enjoyable luxurious setting!